This course is booked direct with another Training Provider. See Training Overview below. Free parking at the venue. May pay a small fee depending on time of year. This is a Surf Life Saving Great Britain (SLSGB) qualification and enables you to demonstrate the minimum level of life saving and first aid competence required to meet the needs of surf coaching qualifications in the UK and abroad. 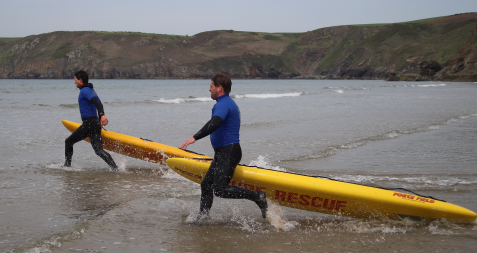 The SLSGB Surf Coach Safety course provides you with an introduction to all elements of lifeguard theory, basic life support, aquatic and intermediate first aid, open water and appropriate surf skills, beach environment, beach patrolling and working practices, communications, and board rescues. Note: This qualification can be upgraded to SLSGB Beach Lifeguard if you meet the more demanding fitness requirements. Minimum 16 years old at date of assessment. Be a current member of SLSGB, Perform a continuous 200m swim in a pool or ocean and run 200m. 24 months from assessment date. Certificates are issued through SLSGB. Delivered by Pete Smith (ASI Trainer), Saltwater Safari, Bude. Payment is separate to ASI. Complete the enrolment form on AS website (find courses) and the trainer will be in contact with you regarding payment. Or contact the Pete Smith direct to enrol and pay. The courses are run by Pete Smith, SLSGB Trainer/Assessor. A previous lifeguard and a local to the Bude area. 62 miles to Bude. 1 hr 15 min drive (car or taxi). By car or taxi. 2 hrs 40 mins drive. By bus, approx 3.5 hours. 210 miles. 4 hours drive to Bude. 1 hr 30 mins drive. Bus service from rail station: to Bude in town. X9 bus. 2 hours drive. Bus service. 50 mins drive. No bus service. Bude, The Strand (in town). Bude is a small sea-side resort town in North Cornwall, about 4 hours drive south west from London. It has a buzzing surf culture and was also the site of the first lifesaving club in the UK. Bude has some of the best surfing beaches in the UK, with good surfing conditions year round. It is recommended by Marine Conservation Society 2010 for good water quality. Sandymouth Beach is owned by the National Trust, and has spectacular cliffs and rock formations with shingle below the cliffs and a large expanse of sand at low tide. There are also a number of other coves and beaches to be found and explored in the local area.